On display in the corner of the Microsoft Store in Sydney are the Lumia 950 and 950XL. Pricing for the smartphones has been set at $999 and $1129 respectively. Microsoft is taking pre-orders with the company's website claiming deliveries will be fulfilled by 8 December. Carrier support remains sketchy. Optus has confirmed to PCWorld it "is planning to stock both handsets". The carrier has yet to determine "timing or pricing details". Vodafone representatives said the carrier will not offer the smartphone, while Telstra reserved its right to comment. It is ‘critical’ Microsoft gains the support of carriers if it is to increase its share of the Australian market, said Foad Fadaghi, managing director of research firm Telsyte. “Carrier support is critical, particularly in its price point. Carrier plans typically drive a lot of initial uptake in the consumer space. “Carriers are really only ranging products that they are confident will sell,” he said. 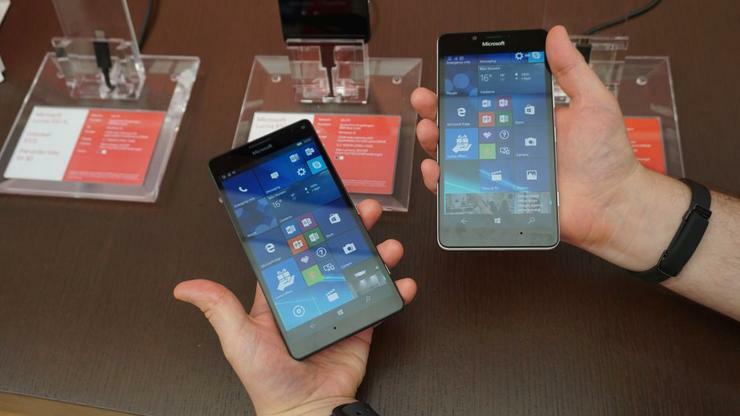 A recent Telsyte study found only 5 per cent of smartphones sold in the first half of 2015 were Windows Phones. Android and Apple accounted for 54 per cent and 41 per cent of sales respectively. The two smartphones have 1440p, AMOLED display, 20-megapixel cameras and a USB-C port. The 5.2-inch 950 is powered by a 1.8GHz hexa-core CPU, while the 5.7-inch 950XL is based on a 2GHz octa-core CPU. Both smartphones have 3GB of RAM, 32GB of internal storage and expandable microSD cards. The 950 packs a 3000 milliamp-hour battery, while the phablet variant has a larger 3340 milliamp-hour battery.